Apparently Starfinder has sold out at Gen Con on the first day. Not totally a surprise, as Gen Con is very much about the feeding frenzy of the goldfish. Anyhow, if you are looking to snag a copy and either missed it at Gen Con OR like me, aren't at Gen Con, your FLGS should have it as well as Amazon. Might just be outliers but best to check. If you buy from Amazon you can always return with minimal hassle. Wow, that's impressive! I was actually just commenting earlier today that I hadn't heard anything about StarFinder in months... There was that bit in the Free RPG Day bundles, but it starting to look like it would be DOA from what I could see. Starfinder will make or break Paizo. I've been hearing rumors for months of cash flow issues and the distribution chain flexing its muscles. Last month's Game Trade Magazine was taking pre-orders on about 7 Starfinder products, all due out in the next month or so. I have to agree with our barkeep. Despite the flashy production values of starfinder, I'm holding out for the newest edition of White Star. I grabbed the PDF. I am not likely to play it "as-is" but I'll certainly steal ideas from it for White Star or Starships & Spacemen. Flipping through it I see what all the hype is about. I play Pathfinder, but it's disappointing that Starfinder feels essentially like "Pathfinder.......IN SPACE!" I'll happily wait for the new editions of White Star and Stars Without Number. Paizo won't lure me in with it's flashy artwork, minis combat and inevitable rule bloat! And don't forget about Alpha Blue and now WEG Star Wars D6. 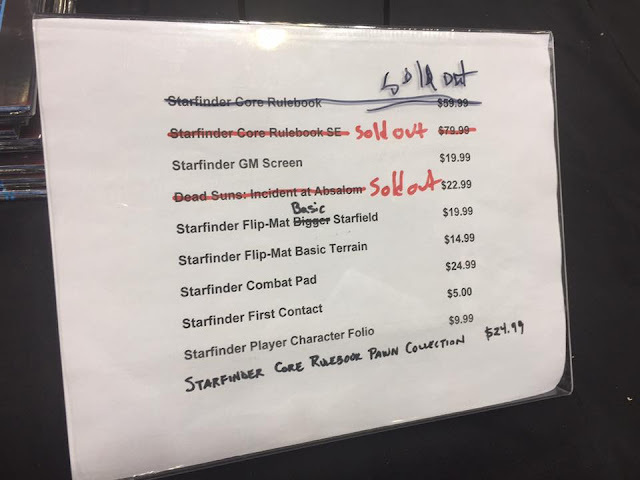 I signed up for the new Stars Without Numbers KS but I'll definitely pick up Starfinder when it hits my FLGS; one local store just texted me to say they'll have seven new Starfinder releases in stock next week. I was disappointed there was no attempt to resupply GenCon. I guess they didn't want to risk being left with a pile of books to pack up and haul back. I'd rather directly purchase from publishers or FLGS than amazon.